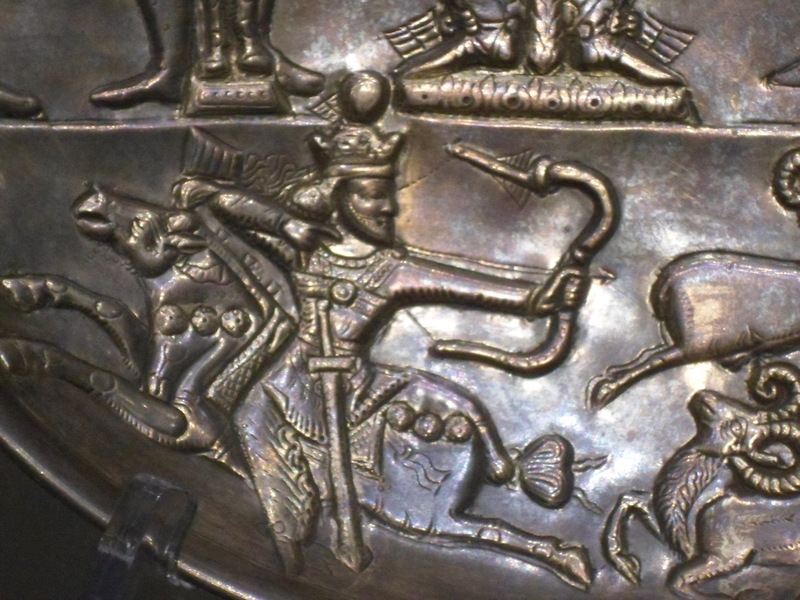 Detail of draw: plate with Khosrow II with nobles. Chased and gilt silver. Iran, 6th century CE. Found in the Perm Region before 1908. Acquired by the Hermitage in 1926 from Kungur Museums. Here are two details from the plate at the top of the post. Detail of draw: Plate with the king hunting predators. Chased and gilt silver. Iran, 7th century CE. Found as part of a treasure in the Perm Region, 1878. Acquired by the Hermitage in 1925 from the Counts Stroganov Collection. Photo by Sean Manning, September 2015. I think that the following plate is especially interesting for the question whether the Sasanids used a thumb draw or hooked three fingers over the string in the ‘Mediterranean’ style. 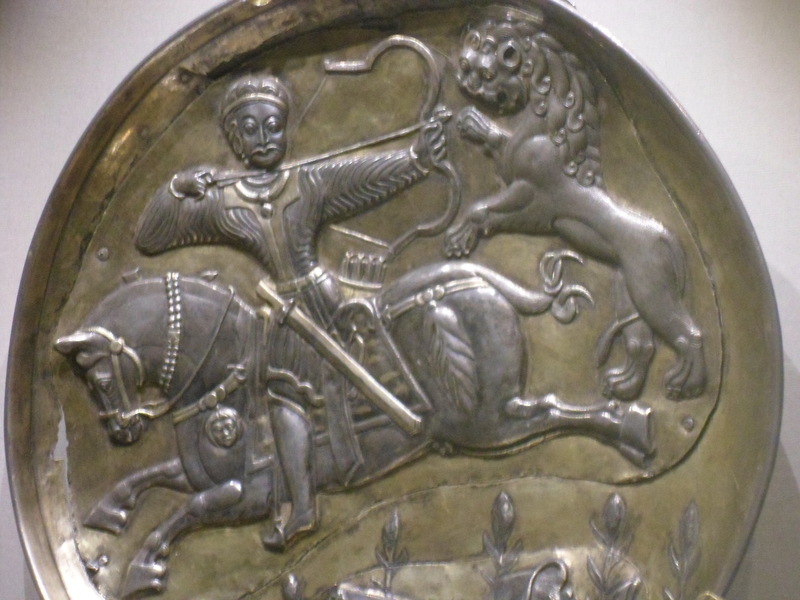 Plate with a horseman hunting. Chased and gilt silver. Iran, 7th or 8th century CE. Acquired by the Hermitage in 1840 by order of Nicholas I with the funds from the Imperial Cabinet. Photo by Sean Manning, September 2015. Detail of draw: Plate with a horseman hunting. Chased and gilt silver. Iran, 7th or 8th century CE. Acquired by the Hermitage in 1840 by order of Nicholas I with the funds from the Imperial Cabinet. Photo by Sean Manning, September 2015. Sasanid archers did not always shoot from horseback. 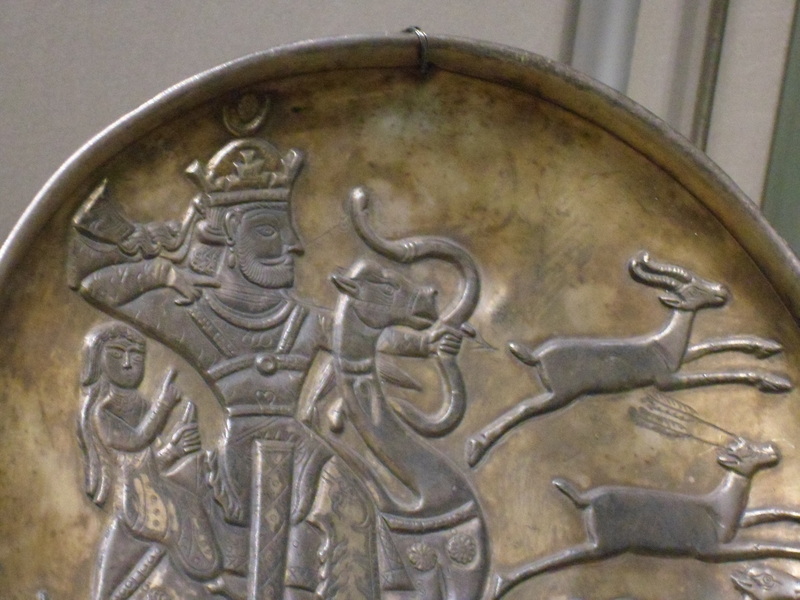 Detail of draw: plate with a king hunting antelope on camelback. Label not available. Photo by Sean Manning, September 2015. I hope that someone finds these photos helpful. Although these Persians are almost a thousand years later than the ones I focus on, I think that ancient archery is an important topic, and one where academics and enthusiasts both have something to contribute. And because I have not read up on this topic recently, and not experimented with the right types of draw on the right types of bow, I think that the best thing I can do is to make some sources available and step back. Further Reading: A. Shahpur Shahbazi, “Army i.5 The Sasanian Period,” Encyclopaedia Iranica (link), A.D.H. Bivar, “Cavalry Equipment and Tactics on the Euphrates Frontier,” Dumbarton Oaks Papers Vol. 26 (1972) pp. 271-291 (paywalled JSTOR link), ryddragyn, The Persian Draw- What Was It? (video link). 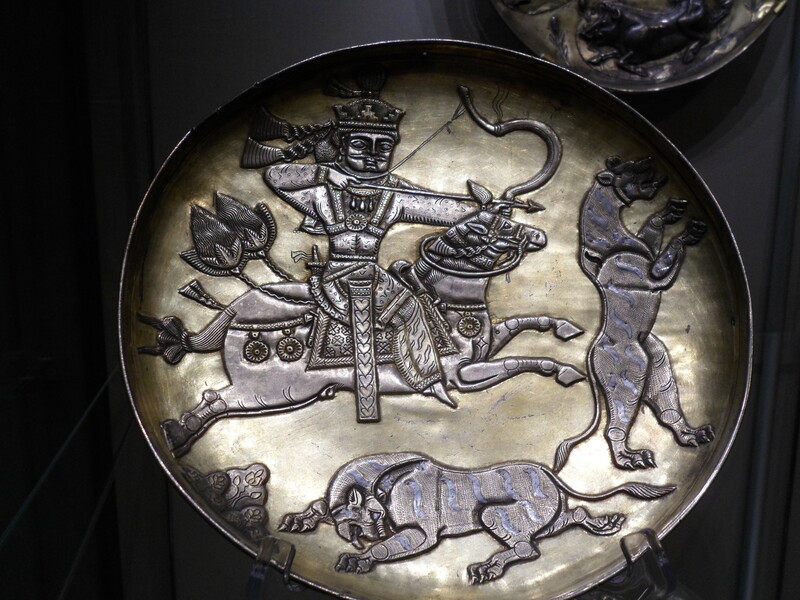 Some other Sasanid silver plates showing warriors on horseback are in the British Museum and the Metropolitan Museum of Art. There will be an issue of Ancient Warfare Magazine on archery in March 2017, and the deadline to propose articles is still well in the future. Thank you for the GREAT quality photos. 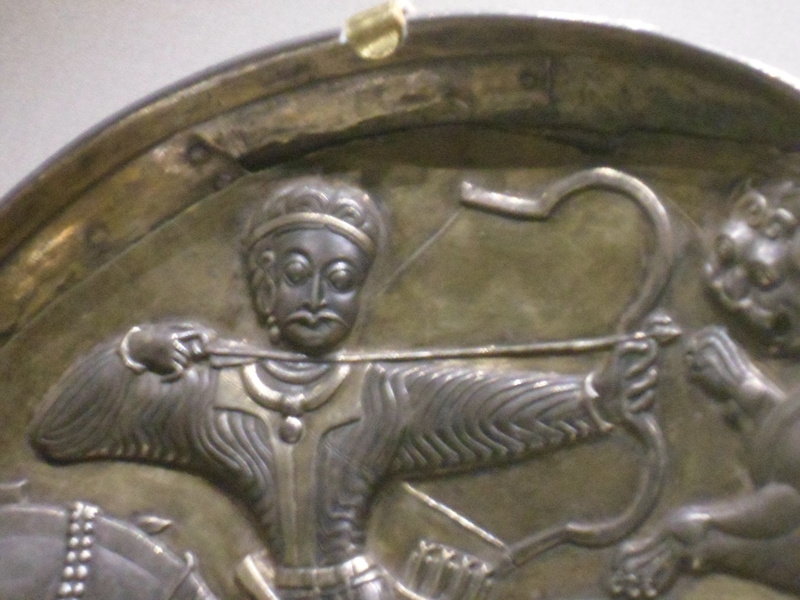 The first image in particular is interesting in that it appears to clearly depict the arrow on the right sight of the bow (on most other silver plates this is very difficult to make out). This would seem to support the theory that the Sassanid draw was a thumb draw variant. Unlike later authors like Bivar, Morse thought that this and other Persian artwork was clearly showing a thumb draw. As far as I am aware this is the only plate to unambiguously show the conventional thumb draw, instead of the hypothetical Persian variant. As Morse notes, the contemporaneous Taq-E-Bostan reliefs show essentially the same thing. 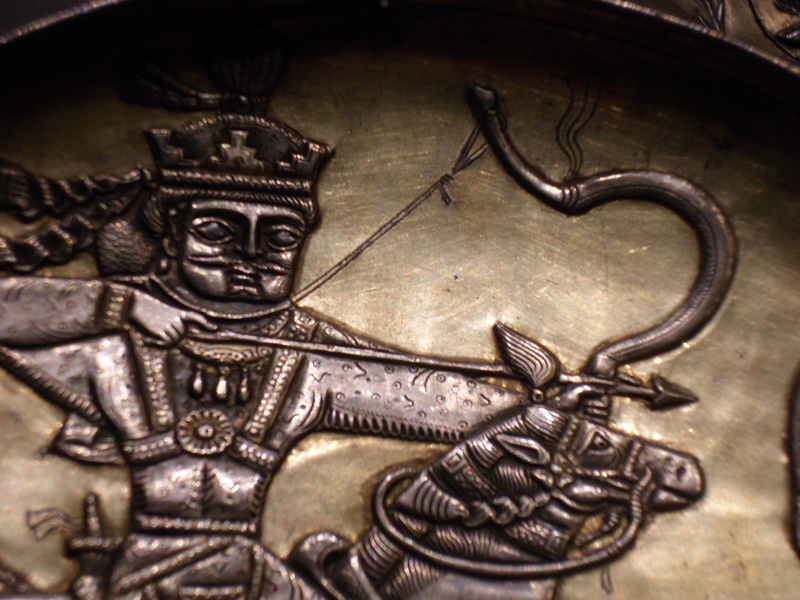 With that plate as an obvious exception, what’s really striking is how the sassanid hunting scenes are otherwise relatively consistent in how they depict the archers’ technique. That could mean strict adherence to artistic conventions, but it could also suggest that the artists were somewhat accurately portraying their subject matter. You are welcome ryddragyn! It seems that the plate with the horseman hunting has the arrow on the right side of the bow too. 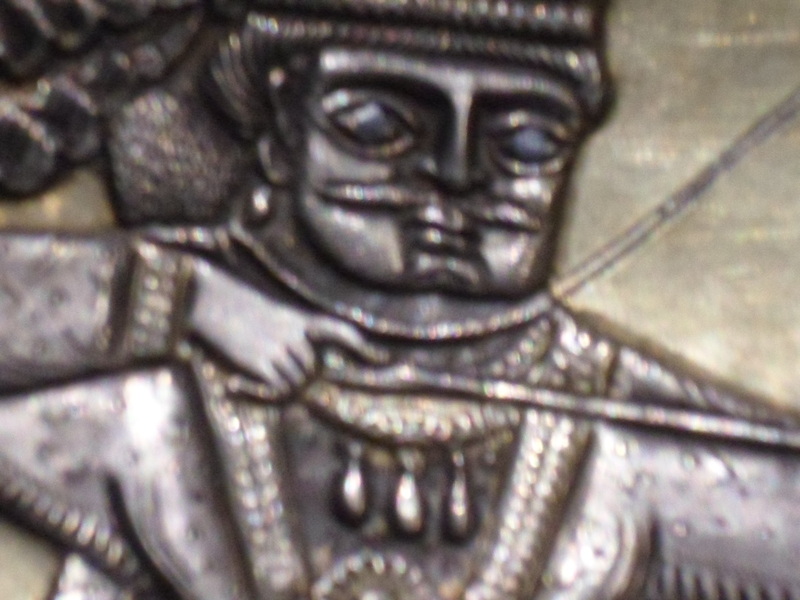 On one of the plates the engraver even tried to show how the bowstring is knotted into a loop … incredible detail. I have not read the booklet by Morse yet but will try to make time for it. I do wonder if one of the early Greek or Arabic archery manuals says anything about how the Persians hold the arrow. The specialists seem to think that those manuals sometimes describe practices which had fallen out of use. Taking photos of shiny metal through glass is hard … I would like to take a photography course one day. A little hand flashlight sometimes helps. The Arab manuals talk about a lot of minor variations of how to do the thumb release, albeit almost 1000 years later. At least in the way that I read it, that is entirely consistent with the angled, not quite horizontal, not quite vertical appearance of the hand in the Sassanid plates. In replicating my interpretation of the plate images, my leather thumb ring even took an oblique/angled groove in it. The text obviously differs from most of the plates in terms of how the index finger is used, though. By the way, I did write to the editor at AW magazine, but I have not heard back yet. I think the staff at Karwansaray are busy launching a new magazine this fall, but they are reliable at getting back to people a few months before the deadline for proposals. I think that I proposed the article on the Hittite Instructions for the Royal Bodyguard six months or a year before they had an issue to fit it in.